The figure shown is painted by Kevin McLaughlin, UE. 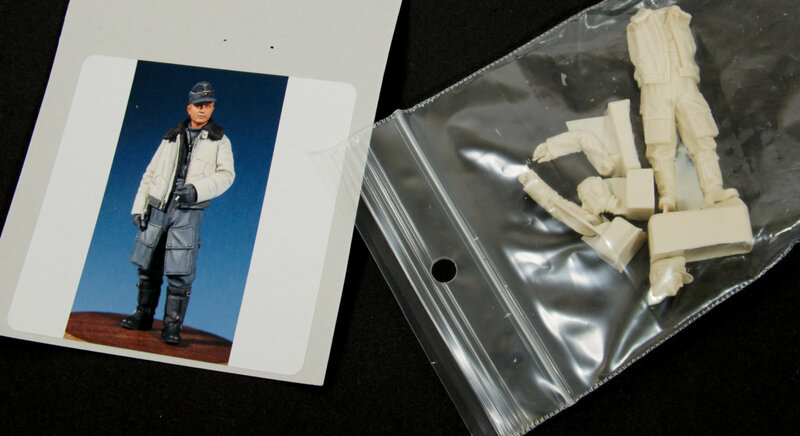 A backing card that has the boxart painted by Kevin Kevin McLaughlin is attached to the zip-loc bag that houses this pilot figure. 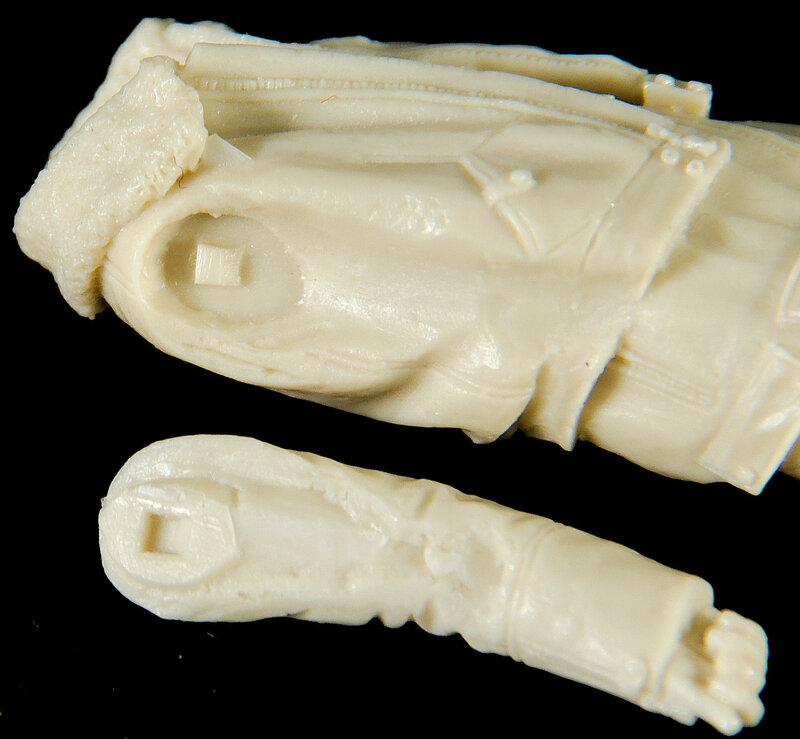 This bag kept the parts safe in transit and kept the arts from falling out of the solid cardboard box that this figure was shipped from Canada in. All of the parts turned up undamaged. 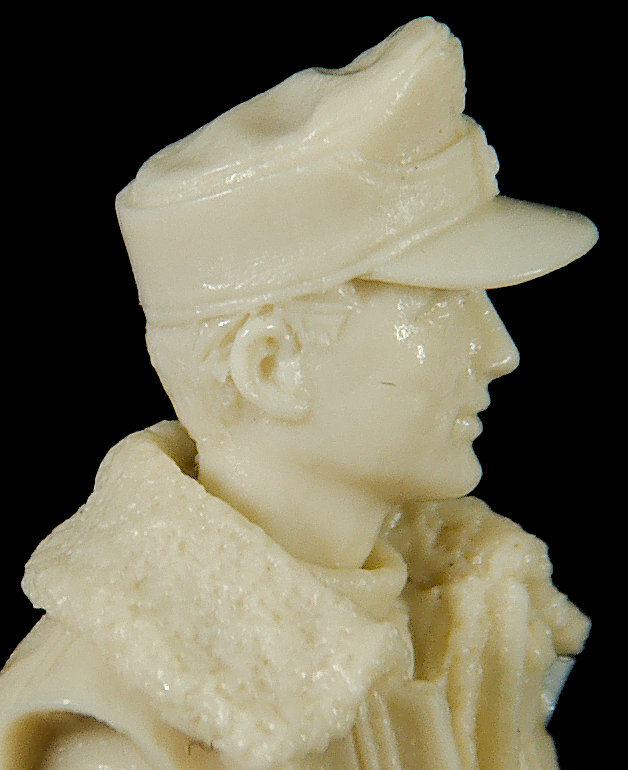 The figure itself is made from five parts in cream resin with two headgear options offered in the one package. 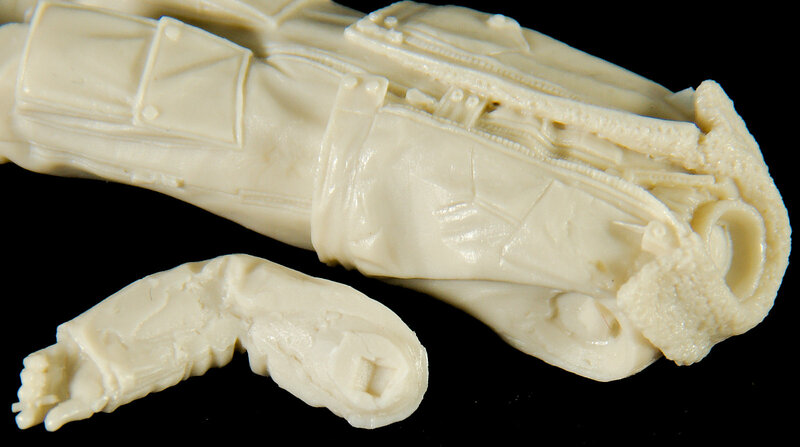 The kit is cast in cream resin with five parts in total, each attached to the casting block that needs to be removed before construction starts. 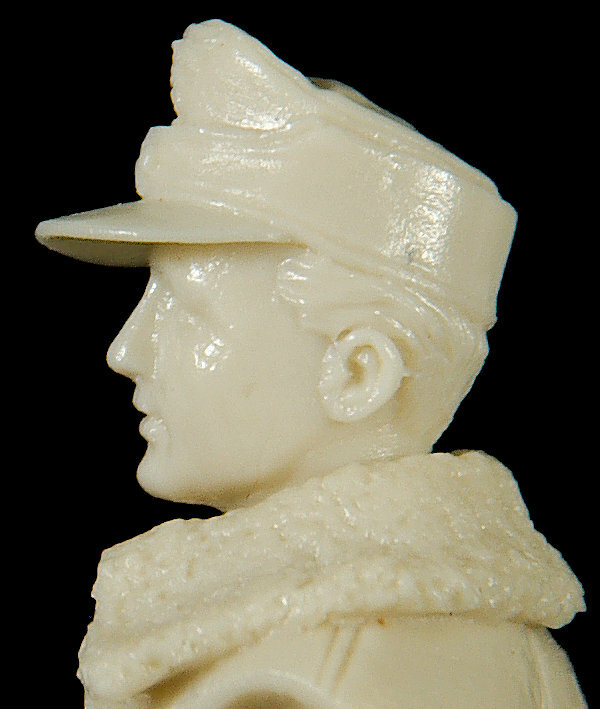 this resin looked free of any release agent and there were no bubbles on the surface of the figure. The blocks themselves looked like they could be removed without too much hassle as the connection to the parts is firstly thin, and secondly at convenient enough places, so smart casting there. Both of these head choices feature the same face but with alternate headgear for the undecided modeller to choose from. 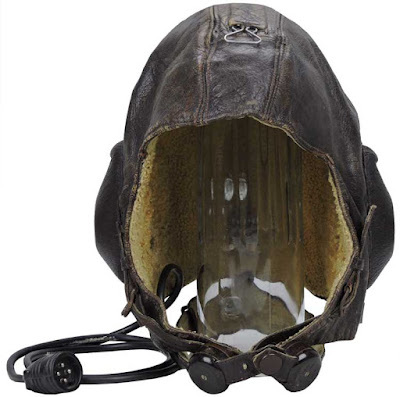 One of the headgear choices is the regular pilot's leather flying cap, while the other is the mid-late war peaked flying cap often worn around the base by Luftwaffe personnel. 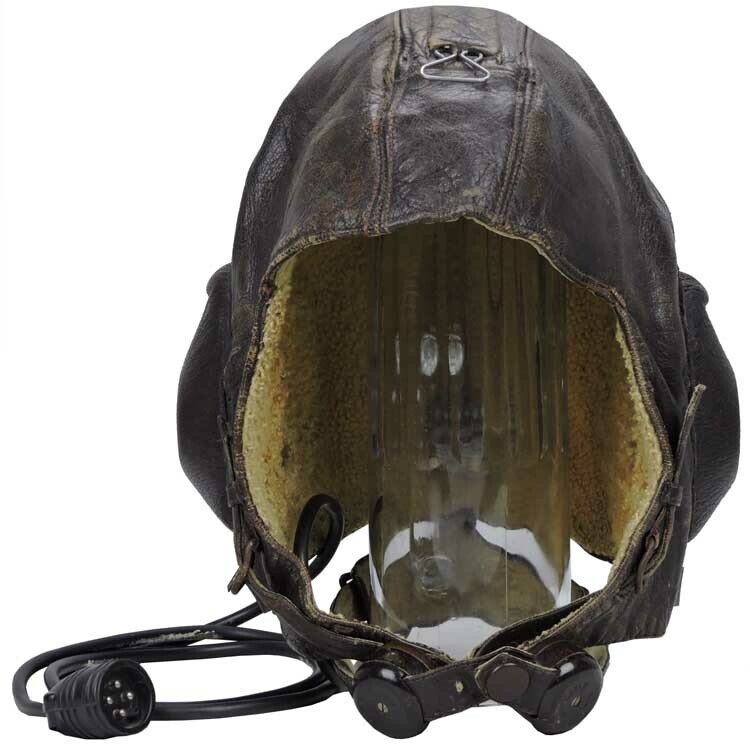 The leather flying helmet has all of the features of this very similar cap in the pictures. 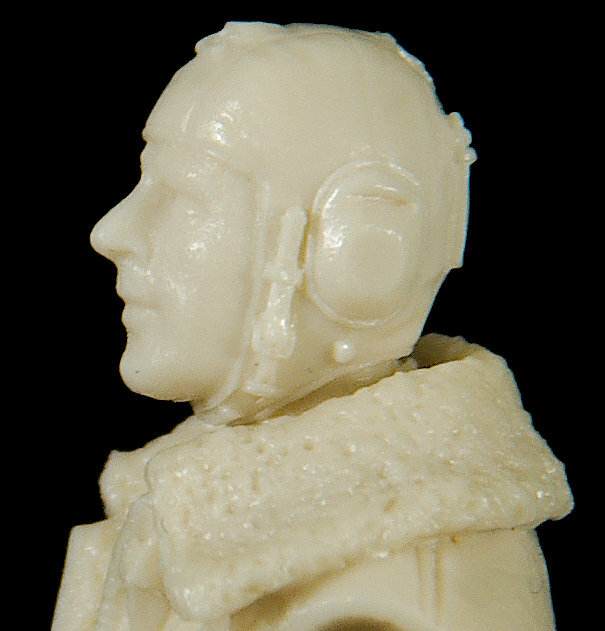 The larynx phone around the neck is added as a welcome accessory, while the pilot's broad features and wide chin give him a friendly, but manly look. 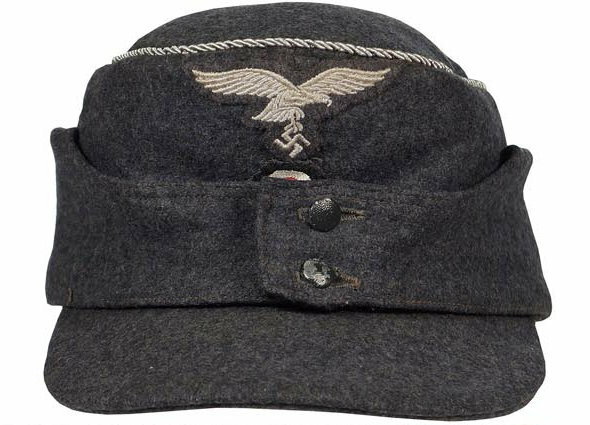 The Einheitsfliegermütze M43 peaked field cap was based on the earlier M42 Feldmütze, (Overseas cap), and the Mountain Troopers Bergmütze, (Mountain Cap), with minor variations. 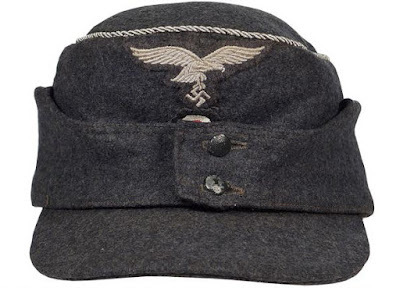 The insignia on the caps included the Luftwaffe style national eagle and the circular, black, white, and red national tri-colour cockade. Regulations dictated that the national eagle was to be worn on almost all headgear and on the right breast of almost all uniforms with a few minor exceptions. Officer’s ranks were distinguished by piping on the crown of the cap with silver piping for the ranks of Lieutenant to Oberst and gilt piping for General Officer’s ranks of Generalmajor to Reichsmarschall while EM/NCO’s caps were not piped. 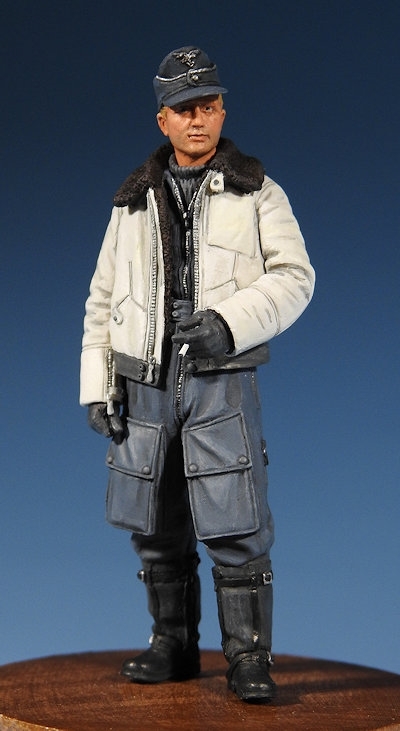 On the one piece resin torso of this figure, he wears a fur-lined Luftwaffe Winter White Shearling jacket that combines with his lined pants to make a winter flight suit. 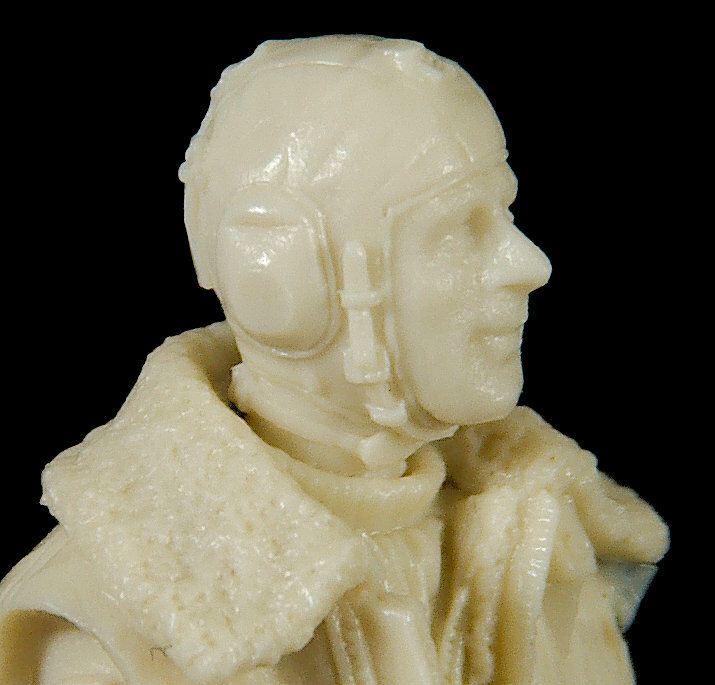 The resin of this suit has been cast so very nicely we can see so many details of the pilot's torso clearly. 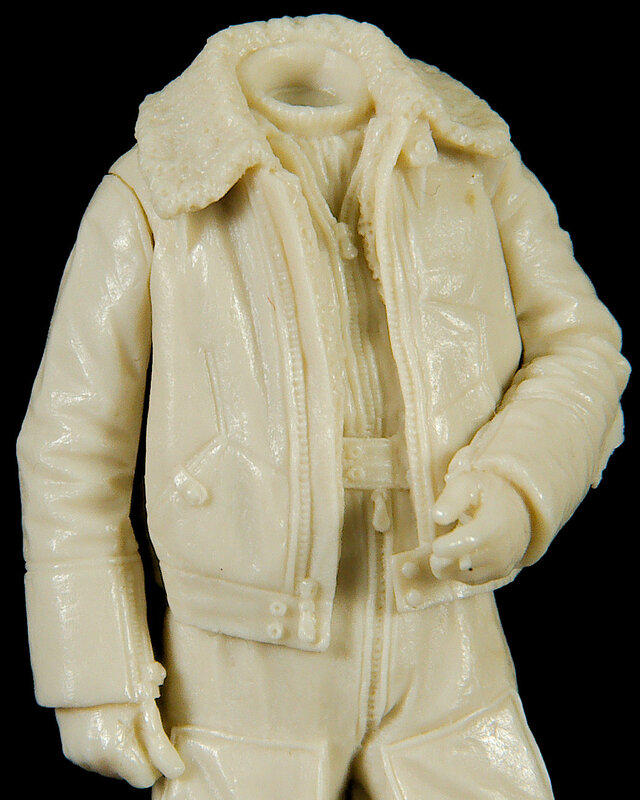 the roll neck sweater is covered by the thick flight suit jacket that again is covered by the leather Shearling jacket with fur lined collar and cuffs. Development of flight uniforms began during WW I and continued to improve the flyer's clothing into WW II. 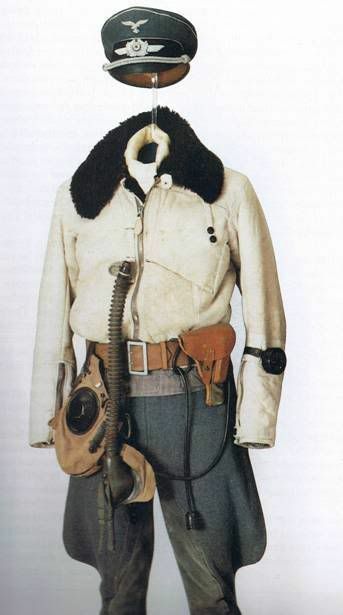 Early in WWII, the pilots used the one-piece flight suit (2 for winter 1 for summer), which in 1936 developed into an electrically heated flight suit. 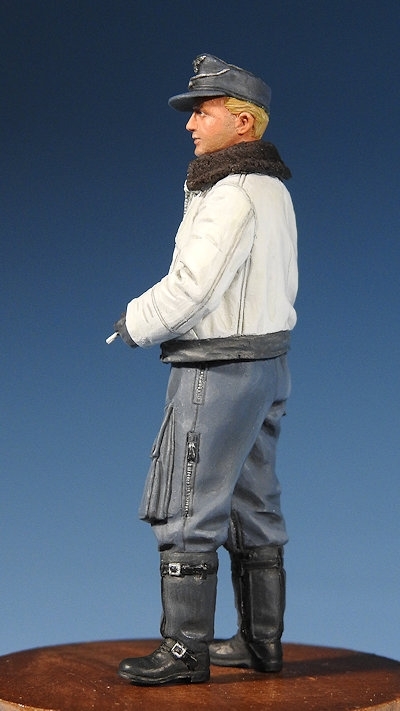 The heavyweight winter flight suits were made large enough to fit over the standard uniform. In 1940, a 2-piece suit (Channel Jacket & Pants) was made for fighter pilots, increasing the user mobility. 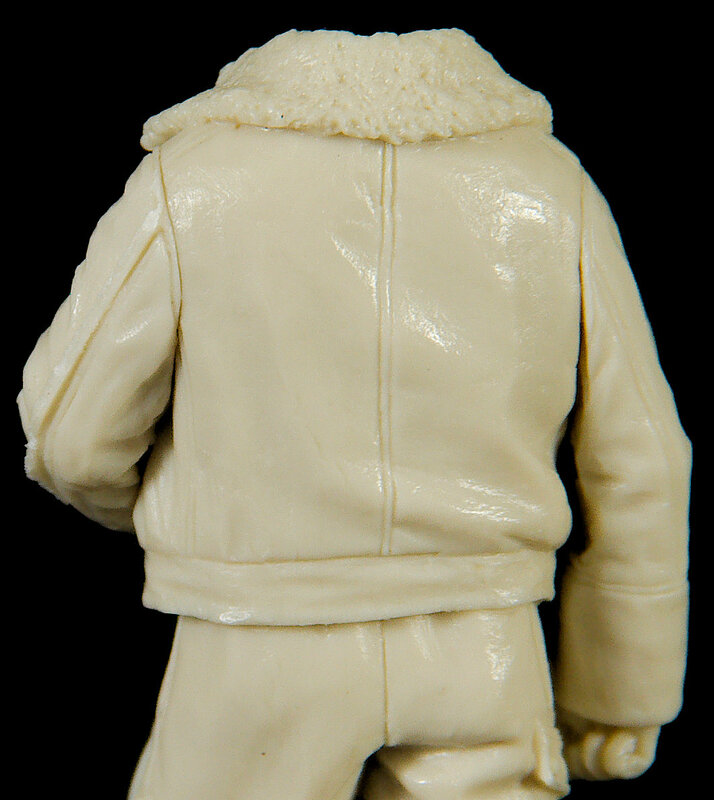 This jacket is seen in a picture below - the Luftwaffe Winter White Shearling material had a woollen lined collar. Originally manufactured in Bulgaria, the white version of the 1-piece suit was only produced until 1942 when the common darker blue suit was standardized. 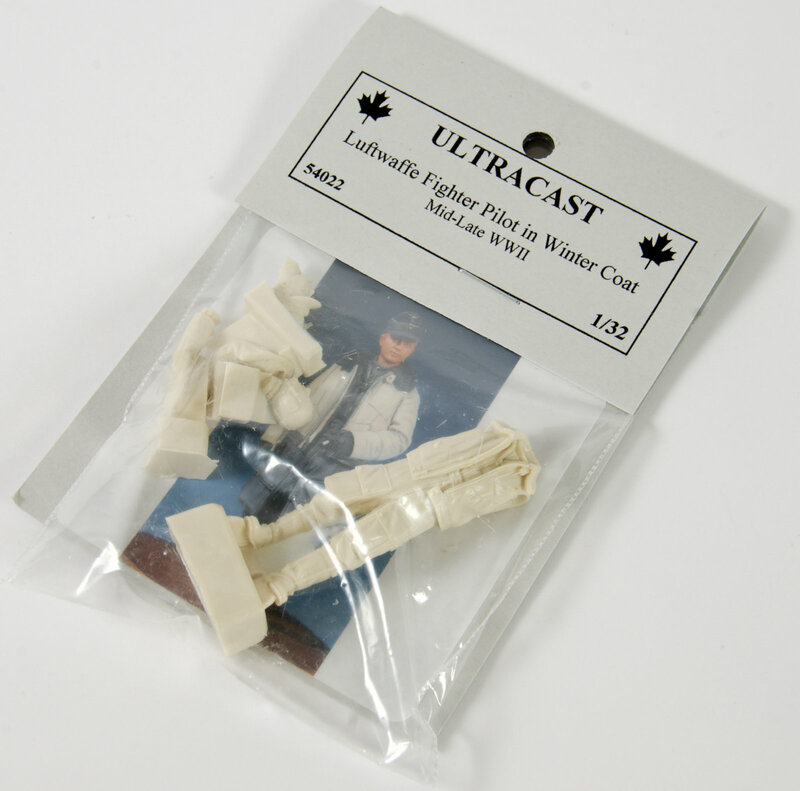 This new figure from Ultracast features this jacket - with all of the zips and folds that can be seen in the pictures of the real things above. 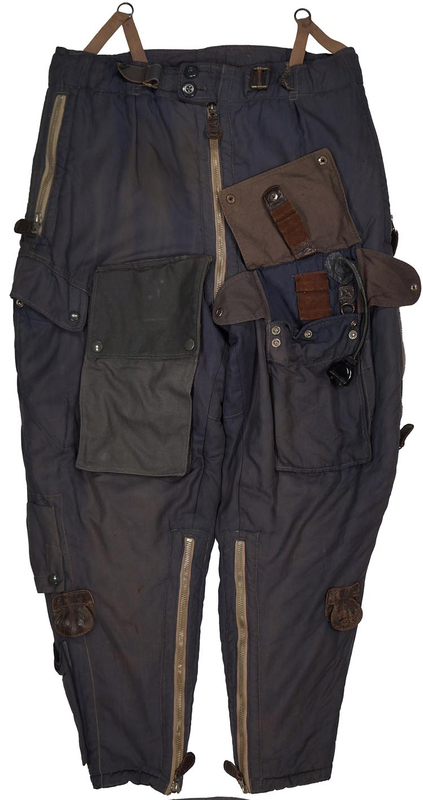 The pilot also wears the Thick lined electrically heated pants that became standard in the latter part of the war. 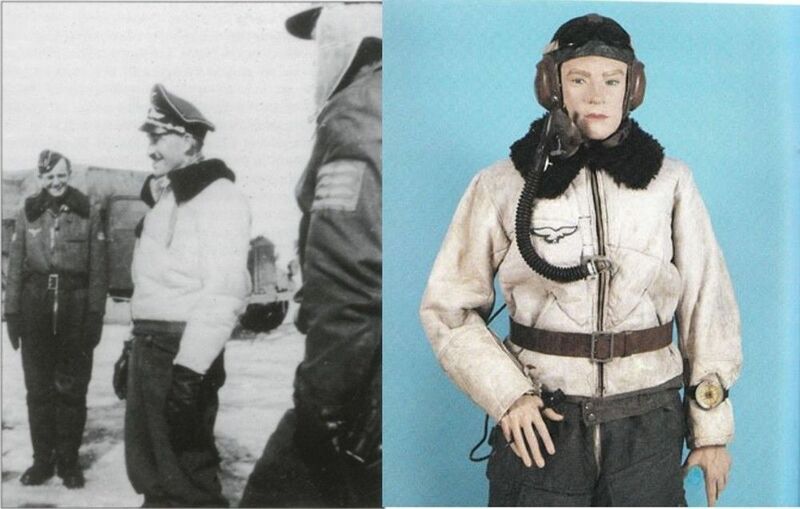 In April 24TH 1941 the Luftwaffe introduced two-piece protective flight suits for fighter pilots which were designed to increase the wearer’s mobility and not be as restrictive in the close confines of a cockpit although the earlier one-piece suits continued to be worn right up until the end of the war. 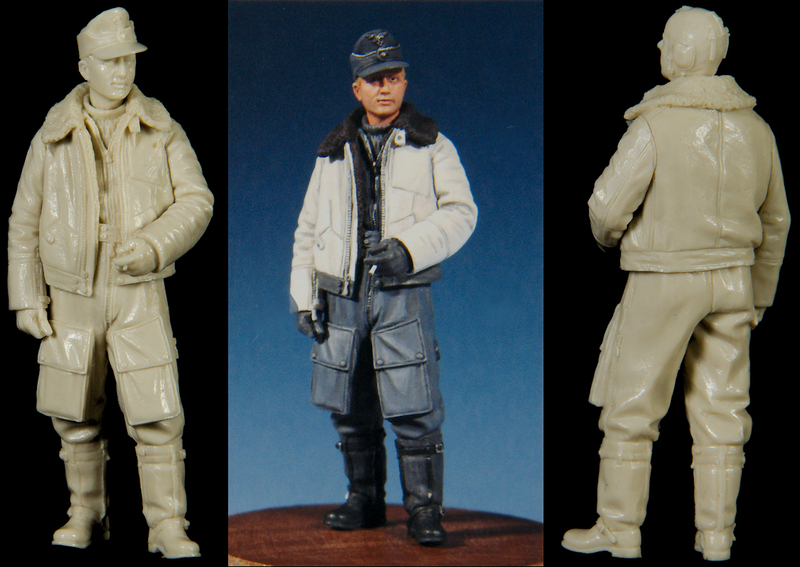 The two-piece flight suits consist of separate jacket and pants and were commonly referred to as the "Kanalanzug", (Channel Uniform). Originally the two-piece protective flight suits didn’t utilize the electrical heating elements although some later models did incorporate the electrically heated feature. 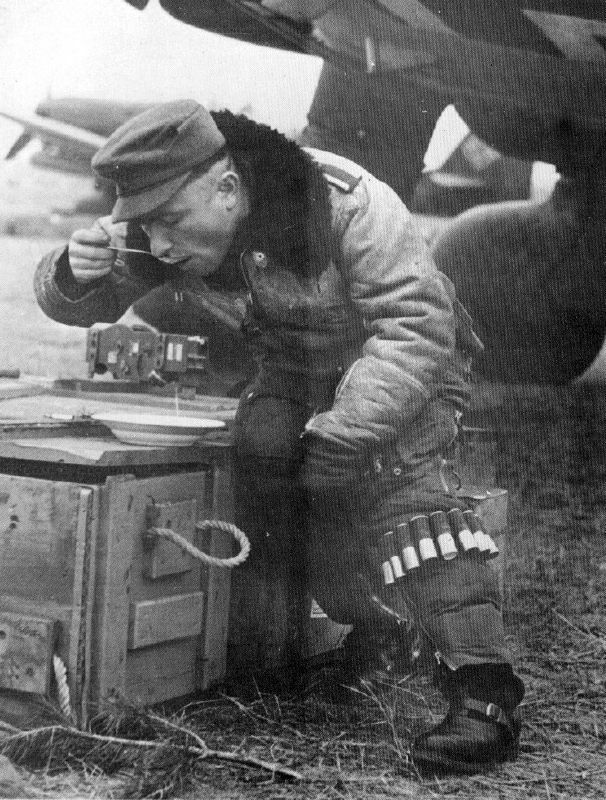 Flight boots were considered an integral part of the flight suit, and the first flight boots developed after WW1 was the fur-lined Model PST 3, which were introduced on November 6, 1935. 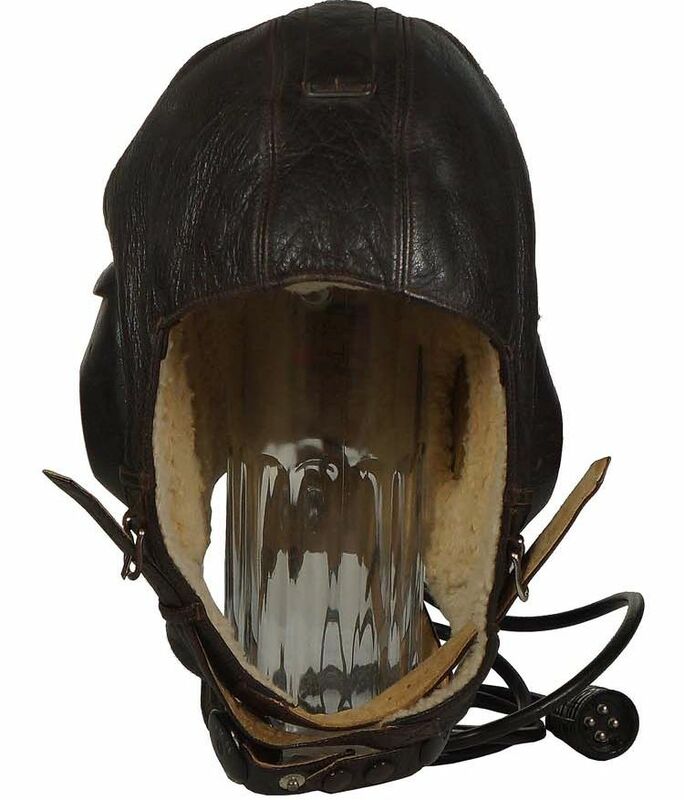 On September 22, 1937, an improved version of the Pst 3 flight boots were introduced and designated as model Pst 4004. 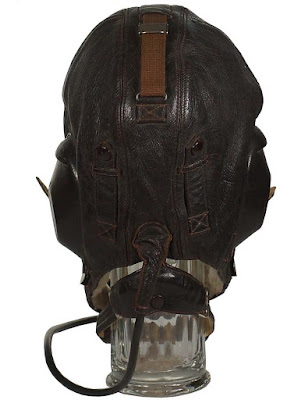 Both the Pst 3 and the Pst 4004 boots were utilized throughout the war. The Pst 4004 flight boots were produced in two, slightly different versions with one having vertical zippers to both the inner and outer leg/calf sections while the other version only had the vertical zipper to the inner leg/calf section. 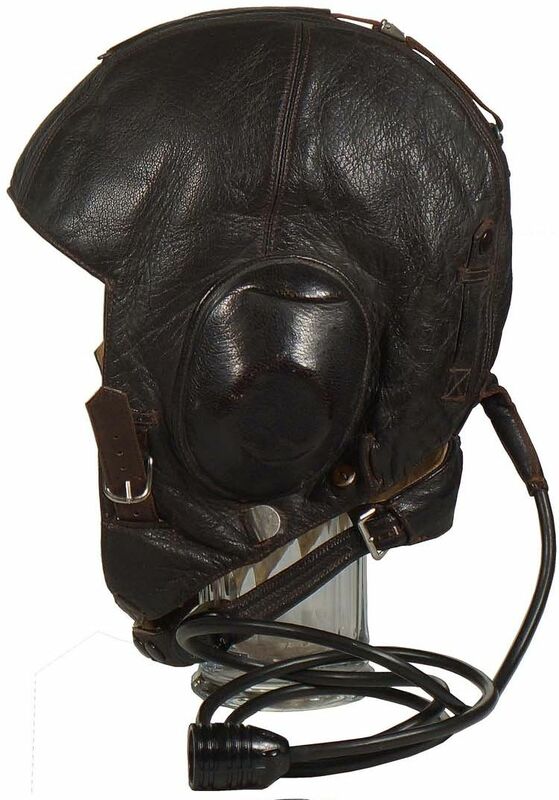 Additional flight boots were introduced during the war including the electrically heated, fur lined, flight boots as introduced on February 16, 1940, and all followed the same basic design. Lastly, we see the two arms that the flyer has wrapped in his layers that end with that white Shearling jacket on the outer layer. 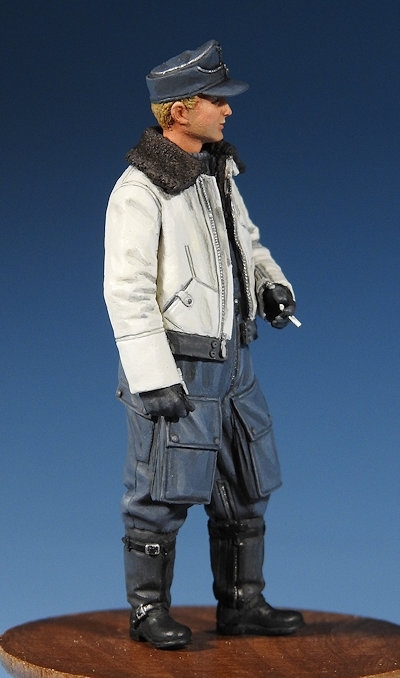 If you look closely you will see that the pilot is smoking a cigarette he holds in his hands that are wrapped in Fliegerhandschuhe Leder - Leather Pilot Gloves. A good feature of this figure and of all other good figures like this are the joints which have lugs and sockets in them to ensure the correct alignment of fit. I made sure these were as flush as they could be before I fitted them to each other. It took only a simple dot of super glue to keep them attached and incorrect placement. The neck of the flyer is conveniently open to receive the neck stub of both of the head choices. Although one of them seemed a bit thin at the neck they do locate in there no problems. 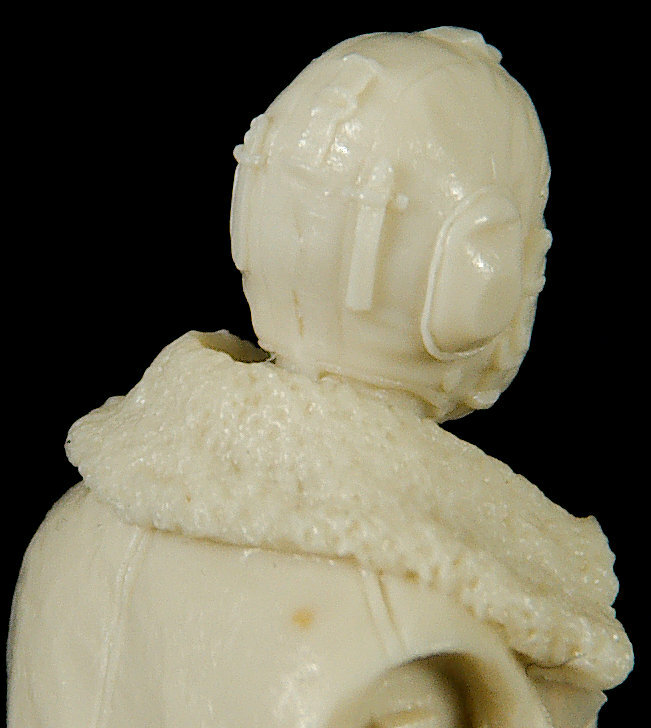 A view from the rear of the figure showing the fit without any gaps at the shoulders. 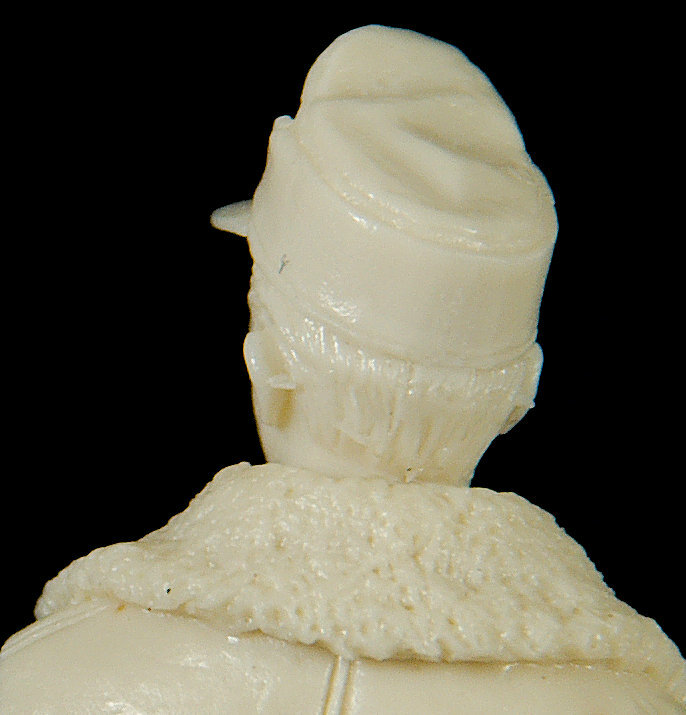 The head once free of the casting block slips into the socket at the neck joint and hides any seam that would appear. Secondly the leather flying helmet choice...here he is more in "office" mode ready to jump in his kite or just returned from a mission. So that is him all made up with both head choices on display - which do you like the best? 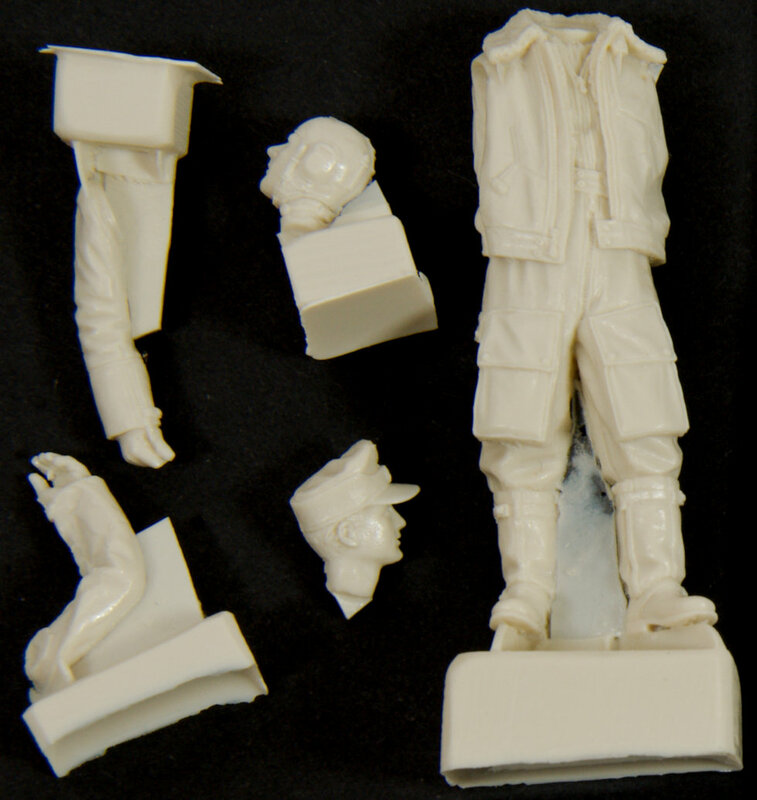 Whilst making this figure we were very impressed with not only how he went together, but the detail in the sculpt by Mr Good. He has again proven himself as a great studier of the human figure and a canny hand at sculpting. 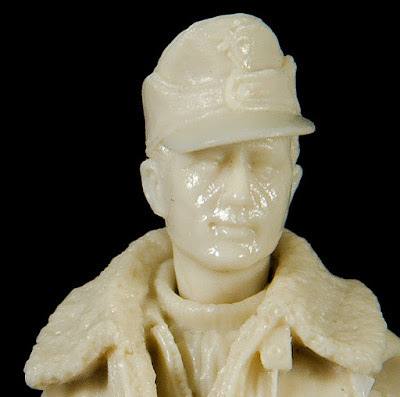 He is convincing as a late WWII Luftwaffe flyer, his body language is great, and the choice of two heads is very helpful if you want variety. I am sure that I am not alone if you have been looking at all of the details like I have. 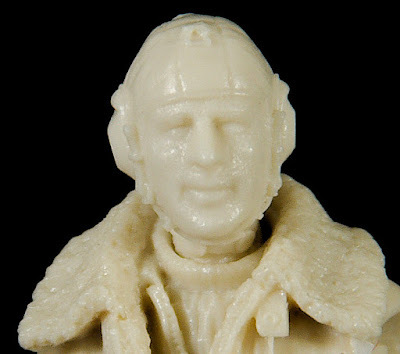 I think that this figure is a winner. 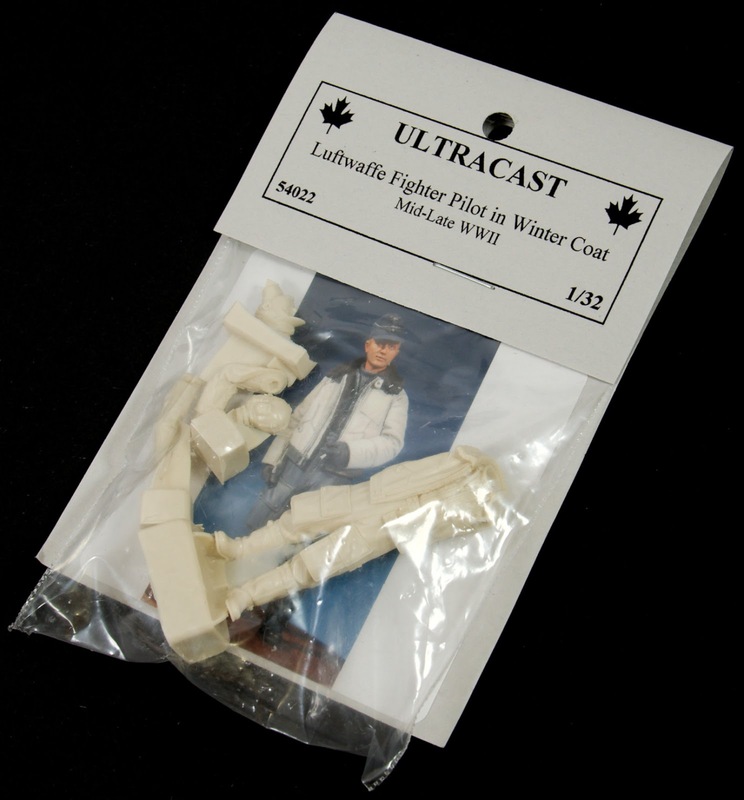 For those who want to see how this figure looks under the hands of a skilled painter, here is Kevin McLaughlin, UE's painted up version that is on the boxart taken from the Ultracast website - this looks pretty good to us!